A fashionable gust of Joan Cornella had blown across Hong Kong in June, and before I knew it, my social media feeds were brimming with bright, sarcastic caricatures and witty imagery. Curious and slightly bewildered by the unfamiliar but strangely inviting works, I decided to pay Cornella’s first exhibition in Hong Kong a visit. It was a sweltering midsummer afternoon, and when my friends and I finally arrived at the North Point venue, there was already an orderly queue formed at the entrance (to my dismay). 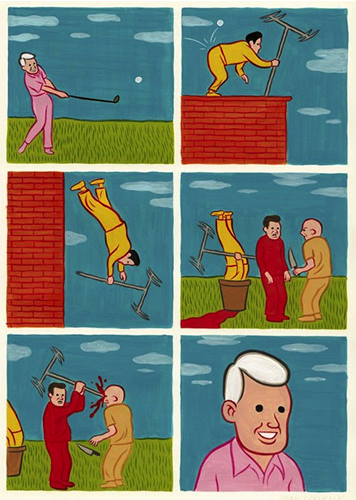 Cornella’s depiction of murder and suicide is catchy. His snarky jab at human consciousness and the conditioned taboo against violence is a hysterical challenge, which is aimed towards the accepted values of society. “Hey look, murder is kind of funny after all” is the message that Cornella relays, as he presents the absurdity of death in his works. Piece one from my humble compilation, which depicts a lifelessly grinning cheerleader balancing herself on the shoulders of her fellow members, communicates the phrase ‘cheer as if your life depended on it’. Little did the characters know, that their teammate was going to suffer at the hands of their slip-ups, as her dainty head fits straight into the cordage of death. Here, the delayed exposure of the plot twist places death in an absurd position: as life itself becomes miniature and insignificant, poising itself on a slim chance – one that is all but in the hands of the beholder. Ropey business extends onto the next piece, where a man survives what seems to be a suicide lynch attempt. A baby-pink bear comes along to lend a ‘helping hand’, only for the man to suffer a tragic death (rather, it was his original intention) as the broken branch is held in its rightful position. Is the moral of the story never to trust baby-pink bears? 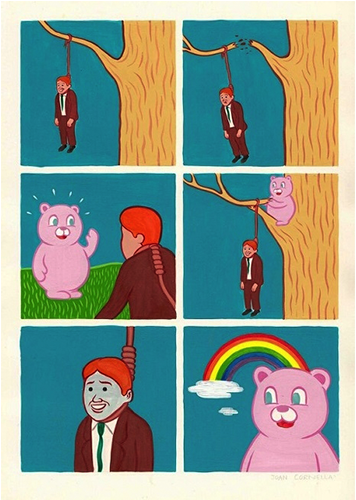 Cornella pokes fun at suicide, whilst painting the bear with a stroke of innocence, as illustrated in the final frame, where a brilliant rainbow compliments the bear’s overly smug grin in the background. The plot juxtaposes everything we have been taught under a socially conditioned vision. The baby-pink bear does not proceed to stop the man, nor does it alleviate his intent to commit suicide; rather, it portrays an elusive detachment to life – its own life, perhaps, and the lives of others. Subtle hints of existentialism, I daresay, makes an appearance. Do not trust baby-pink bears, ever! The next piece suggests a reference to the #blacklivesmatter movement, and the atrocious, fatal hate crimes committed by the police against Black Americans. 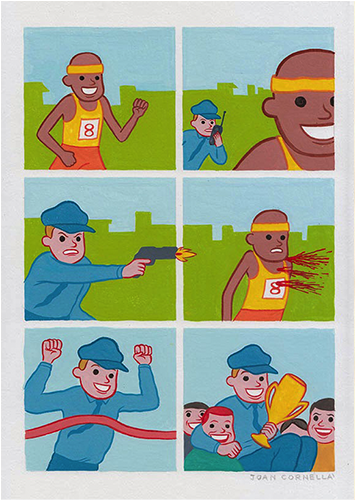 The piece depicts a man with darker skin running a marathon, but never reaching the end as he is shot to death by a white policeman, who runs to the finish line and obtains a large trophy with a herd of celebrating, white men. The white privilege that has been accepted by humanity for hundreds of years is wittily portrayed here, as the exaggerated scenario which is portrayed is not only a reflection, but also a challenge towards the hate crimes and shootings in the U.S. against people of colour as of recent years. The ridiculing of death and murder does not stop, as Cornella depicts a linearity of a man hitting a golf ball in another piece, in which this action builds to another man’s death, while the life of another man who is threatened at a knifepoint is saves, as he takes the fishbone antenna and kills the man who is threatening him. Meanwhile, the golfer is watching from afar, wearing the standardized, smug grin that all Cornella’s perpetrators are seen with. The illogical sequence of events that lead to the final death in this series is so preposterous that it becomes hilarious, and may be the epitome of ‘casual violence’ that has attracted the world to witness its glory under Cornella’s paintbrush. In a sense, this piece may actually be perfectly logical. The golfer is at a position too distant to help, and so, had to sacrifice another person’s life in order for the victimized man to obtain an object for defense. Interpretation lies somewhere between being logical and illogical, as Cornella allow hid audiences to place the notion of death on a scale of absurdity and confusion.